Admission for up to 4 People + $10 Credit + 4 Strawberry Slushies! Sweeten your spring with strawberry picking and farm fun at Butler's Orchard in Germantown, MD! A family-run pick-your-own farm since 1950, Butler's Orchard has been growing family fun for generations. The original 37-acre farm has grown to 300+ acres - with 25 varieties of fruits, vegetables, flowers and trees. Your Strawberry Picking Outing will start with a short tractor-driven trolley ride out to the most bountiful of Butler's Orchards nine acres of strawberry fields. Take in the sweet aroma of strawberries, meander through the endless rows of red gems and pick to your heart's content. What a perfect photo opp! Even more importantly, what a perfect opportunity to understand where real food really comes from. 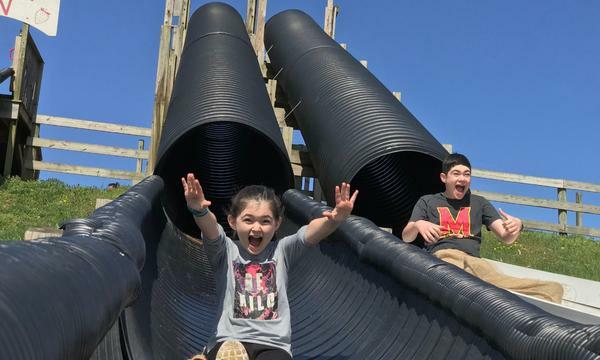 FIVE Giant Slides - Grab a burlap bag and get ready for a 30 - 100 ft. thrill ride! Wooden Climbing Structures - Climb or slide as you explore a playground-sized boat, castle, train and John Deere tractor! Pedal Tractors - Race around the pedal track on a kid-sized tractor! Rubber Ducky Derby - Try your hand at some serious water pumping as you race duckies down a canal! John Deere Combine Slide - You have to see it to believe it! Farm Animals - Meet and feed the friendly herds of goats, baby lambs and sheep. Say hi to the chickens. But don't miss the mom and son donkeys or the star of the Farm Park: Charlie, the pot belly pig. Nature Trail - A half-mile interactive, educational walk through the woods, identifying native wildlife. Picnic Area - Bring your own lunch or purchase a light lunch from the Food Barn. Enjoy your lunch on wooden picnic tables, scattered throughout the shady areas of the Farm Park. Baby Changing/Nursing Station - with rocking chairs and changing tables. On your way out, don't forget to make one final stop at the Farm Market for Butler's Orchard famous strawberry slushies! Shop for local produce, fresh pies, apple cider donuts and seasonal giftware. Don't miss the Kid's Corner with special children's toys and books! Strawberries are ready for picking at Butler's Orchard. You'll be "berry" happy you came! Dates: Valid mid-May to mid-June 2019 to coincide with strawberry picking season. Ripening of strawberries is dependent on the weather. Please call 301-428-0444 before visiting to verify that a good supply is available on the day you want to pick. Click HERE for crop calendar and updates. This voucher provides admission for up to 4 people. Have more people than 4 people in your group? No problem! Additional admissions are just $3/person, payable directly to Butler's Orchard upon arrival. Children under 24 months receive free admission. Bring your own container for strawberry picking or purchase a container at Butler's Orchard. Cost is $.25 - $2.00, depending on the size. Tractor-driven trolley ride to u-pick fields on weekends only. During the week, you can drive your car right to the u-pick fields. No charge for admission on Wednesdays. Expiration: June 20, 2019 - or when strawberry season ends. Please call 301-428-0444 before visiting to verify that a good supply is available on the day you want to pick. Please present your voucher for entry - on smartphone or printed. Follow signs for check-in at the Farm Market or Welcome Gate. Valid only during Butler's Orchard strawberry picking season which typically runs from mid-May-mid-June. Multiple vouchers may be purchased and redeemed. Valid only for the dates/sessions listed above. Cannot be combined with any other special offers, promotions or discounts. Not valid on prior purchases. Vendor is responsible for the quality of the products or services provided at redemption. Operating hours are subject to change; check directly with vendor prior to visit. Merchant cancellation policy applies.